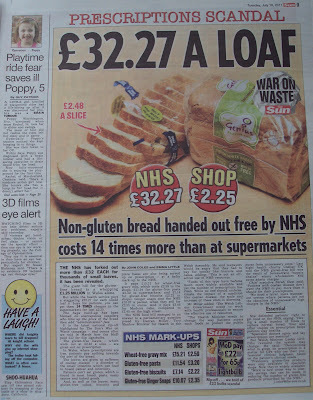 On 19 and 20 July, several newspapers reported that the NHS was purchasing gluten-free bread for £32.27 per loaf. The Mail, Mirror, Express, Sun and Telegraph all carried the story. It appeared that none of the journalists bothered to check the facts - if they had, they would have found the cost for a single loaf was closer to £2.82. 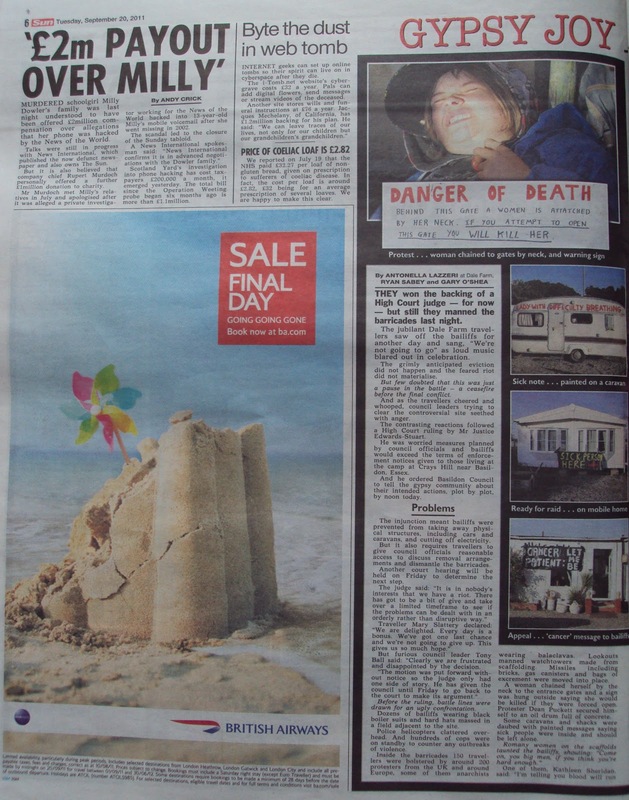 To its credit, the Express ran its correction the day after it published the original. 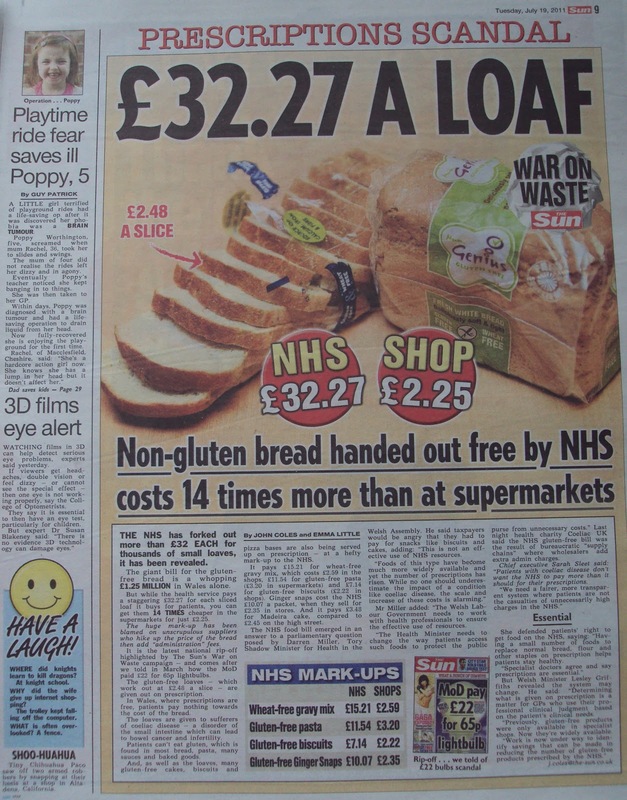 We reported on July 19 that the NHS paid £32.27 per loaf of non-gluten bread, given on prescription to sufferers of coeliac disease. In fact, the cost per loaf is around £2.82, £32 being for an average prescription of several loaves. We are happy to make this clear. At the time of writing, this does not appear on the Sun's website. The original article and the accompanying editorial, are both still on there, however. Neither has had the correction added. Yes, it's the smallest headline and shortest article on that page. Given that the story was proved to be wrong within a day of its publication, it's not clear why it took the Sun two months to correct it. It's also unclear when the Mirror, Mail and Telegraph will correct their versions - all of which remain live. COMMON sense prevailed when two British soldiers were cleared of abusing Iraqi prisoners. Major Michael Peebles and Warrant Officer Mark Davies served with courage and bravery in the most difficult conditions. This ludicrous show trial, which has already seen four other soldiers cleared on the judge’s orders, has been a waste of time and money. These men risked their lives in Iraq but were repaid by being hung out to dry. Every aspect of investigating so-called crimes within the military needs to be re-examined. Our servicemen and women deserve nothing less. NOTHING can excuse the savagery that led to the death of an innocent Iraqi prisoner at the hands of British squaddies. As David Cameron says, it was shocking and appalling. And it must never happen again. There are vital lessons for the Army over the scandal of hotel worker Baha Mousa, who died of 93 injuries inflicted by brutal captors in a detention centre. 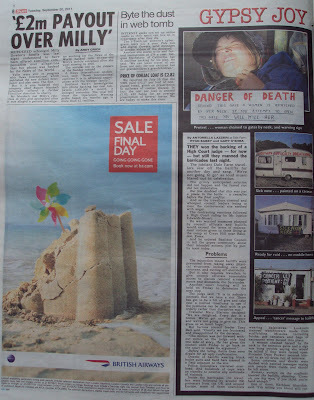 The Sun's security expert, Andy McNab, points out that squaddies on active service are pumped up and highly aggressive. In war, their lives depend on it. Responsibility for channelling that aggression, and enforcing rules on treating prisoners, falls to senior commanders and top brass at the Defence Ministry. Yesterday's public inquiry report condemned a shameful failure of leadership. It also hit out at the conspiracy of silence over the killing of Mr Mousa. Defence Secretary Liam Fox must act decisively with sackings — although he is right to insist that firm interrogation techniques remain an option. Most Service personnel are fine men and women doing a tough job. Yesterday the latest soldier to die in Afghanistan was brought home, a tragic reminder of the perils our brave troops face daily. A handful of bad apples must not be allowed to tarnish the whole Army. Whatever happened to common sense? And perhaps the Sun can also elaborate on whom outside the military contributed to the "conspiracy of silence" following the "savage" treatment meted out to Baha Mousa. After all, a handful of bad apples must not be allowed to tarnish the whole of the British media.